Historically the most common architectural use for glass has been for plain residential or commercial windows, in which case the thickness rarely exceeds 3/8", except for the very largest windows. More recently any glass over 1" that is custom made for tabletops, countertops, flooring, stair treads, etc. has come to be known as "thick glass". 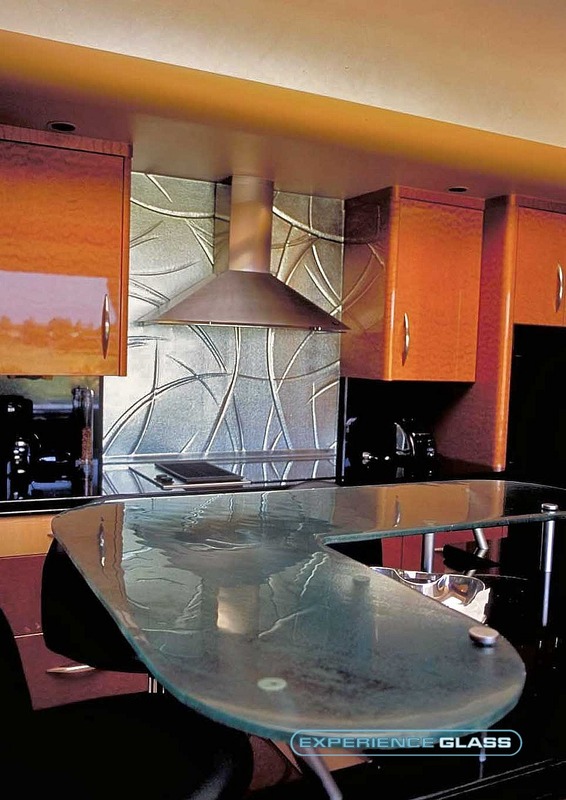 Over the years our company has produced thousands of unique thick glass kitchen countertops, often incorporating ColorFuse glass for a seemingly infinite variety of colors, patterns, shapes, and textures. We view every new project as an opportunity to create something distinctive and exciting. 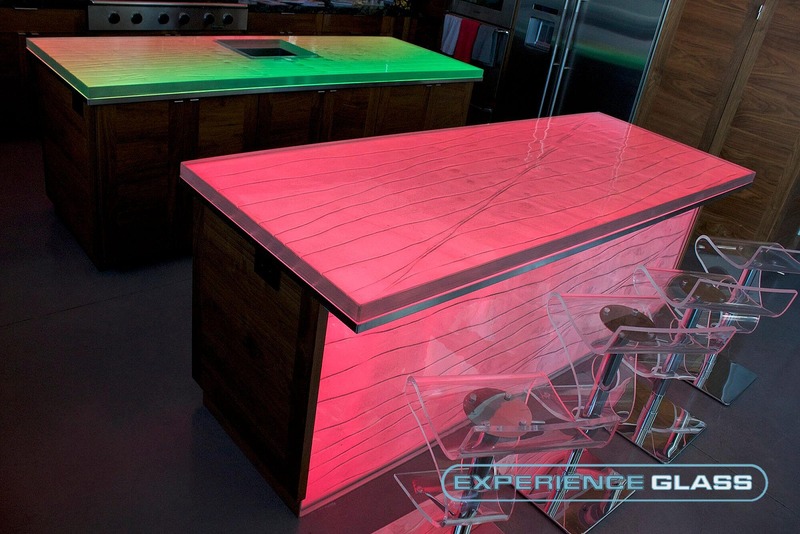 If you are looking for something truly unique for your home or office, the beauty and functionality of a custom made thermoformed glass countertop is guaranteed to offer many advantages over other common countertop materials. Our in-house factory gives us the ability to fully customize your project to your needs, making any glass countertop a unique and attractive choice. To carry out our mission of producing eye catching, one-of-a-kind products built to your specs and your tastes, our in house design team often collaborates with kitchen designers, interior designers, and architects to produce something truly unique that meets and even exceeds your expectations. If you do much research for terms like "glass kitchen countertops" (and believe us when we say we have researched the heck out of that term! 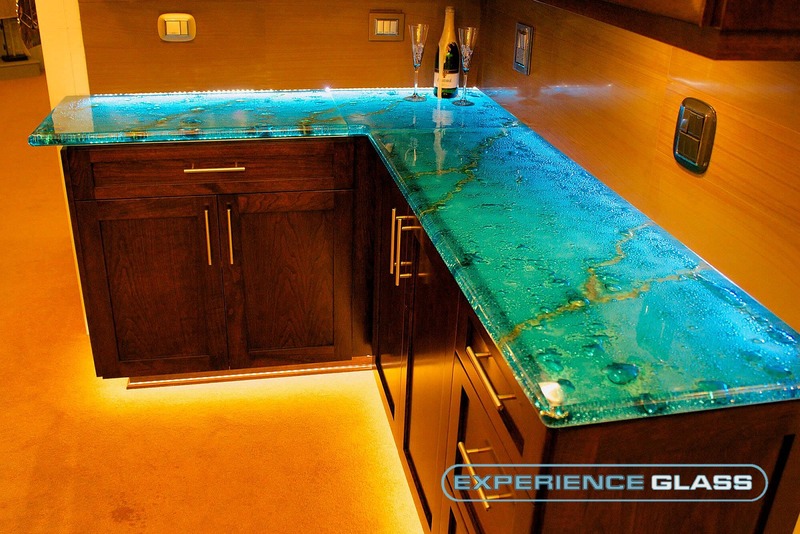 ), you will no doubt find many results for kitchen countertops made out of recycled glass. However, in most cases this means chunks of broken glass suspended in a composite base, giving the finished product a random, patternless look not unlike a tile mosaic. On the other hand, our custom made solid glass countertops are produced from kiln fired glass manufactured right here in our Carlsbad factory. Because we are in complete control of the glass manufacturing process from start to finish, we have total command of the looks and construction of the finished product, no matter what kind of look you are after. So even though the search terms may be similar, the products most certainly are not! 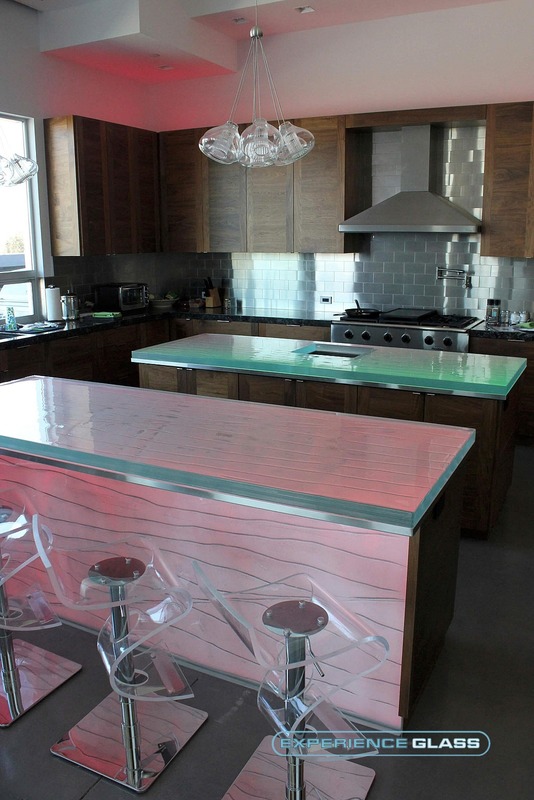 So as you can see, our solid glass countertops are the clear winner in almost every way! What Surfaces Can I Use Glass For? 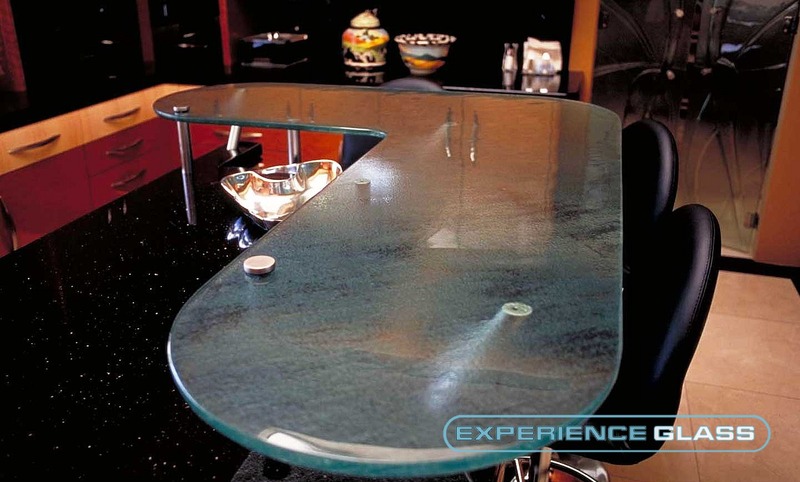 It’s a common misconception that a glass bar or countertop will be fragile and easily broken. Back when glass was first used in windows and mirrors, it was inherently fragile due to the relatively crude processes available at the time. However, with modern advancements in manufacturing, the truth is that granite and glass have very similar properties. As a matter of fact, in most cases a custom glass countertop is actually stronger than granite or stone, as it is a much denser and more structurally consistent material. Imagine a slab of granite at a quarter (¼”) inch thick. It would break with significantly less force than ¼” glass, due to the pores, veins, and imperfections in the stone. 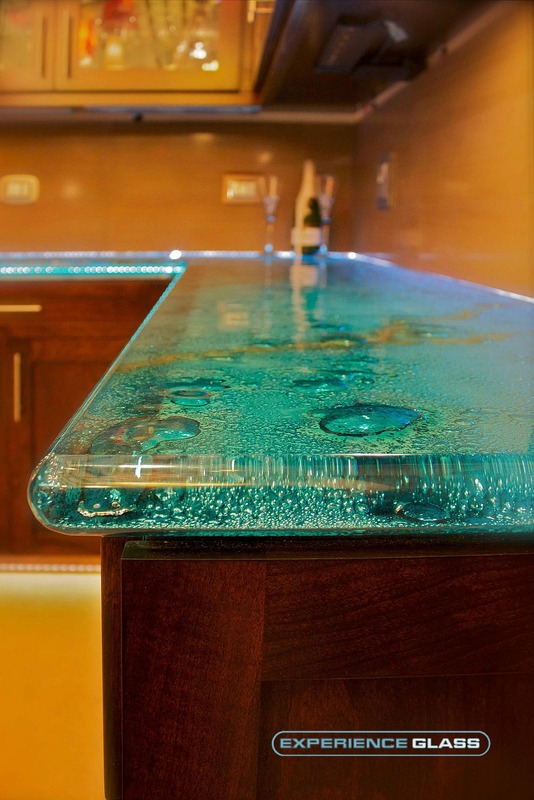 On the other hand, a glass bar top, tabletop or countertop at 1″– 3″ thick is quite a substantial piece of material. Countertops with 3/4″ or less thickness can be tempered to harden the surface, creating a safer, stronger piece. 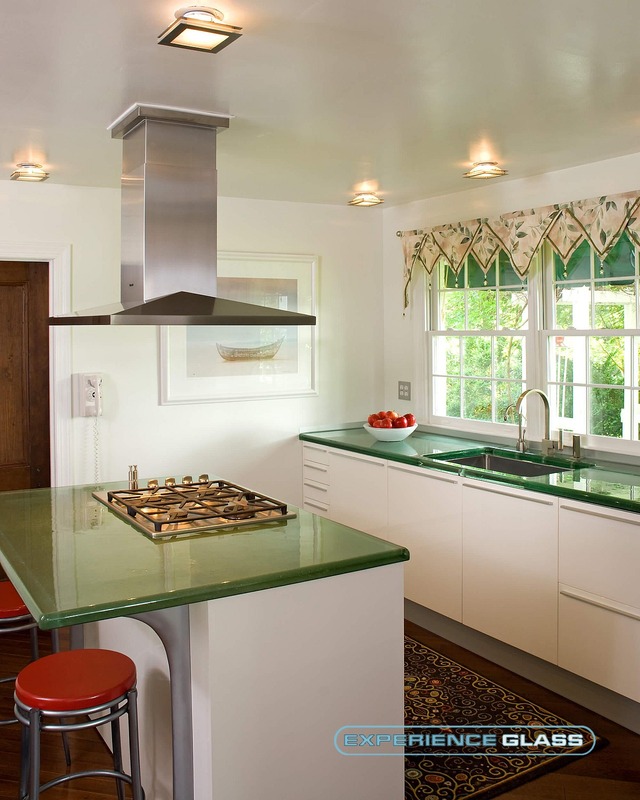 Believe it or not, glass is much more durable than granites and synthetic countertops. It is a harder, denser material that scratches and chips less. Textures and colors in the glass make small scratches nearly invisible, if they should occur. There is also NO change in appearance or durability over time! Although we do recommend using hotplates for safety, hot cookware can generally be placed directly on its surface. A little common sense goes a long way! Cutting on glass is possible, although we recommend using cutting boards to save and maintain longevity of your cutlery. Glass is actually a much more sanitary surface than most wood or plastic cutting boards! 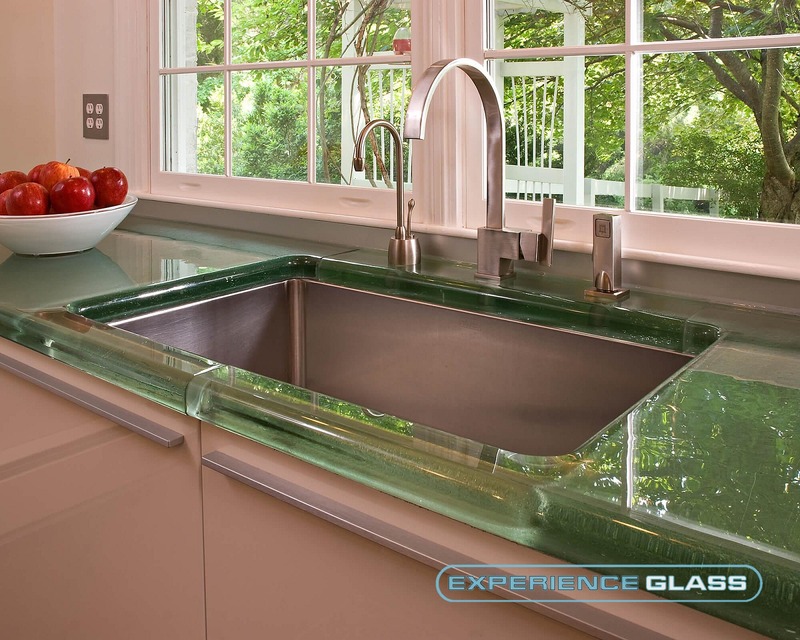 Glass is a non-porous material, making it the most hygienic material available for countertops. This is also why glass is stain proof. Fingerprints and watermarks are also nearly invisible when the glass includes textures and/or colors. It is recommended to towel dry any wet areas to eliminate watermarks and streaking. The surface can be cleaned with a sponge (do not use abrasive side) or towel. Window cleaner and paper towels are preferred for optimum shine. Certain cleaners have been known to have chemicals that cause a haze and are not recommended to be used. Give us a call today with your ideas and we will help make them a reality!